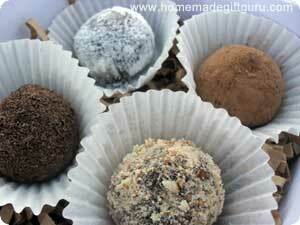 Truffles Make Gorgeous Homemade Food Gifts! Real chocolate truffle recipes will produce soft balls of chocolaty ganache. They may have a coating of tempered chocolate, something crumbled or powdered, or possibly no coating at all. 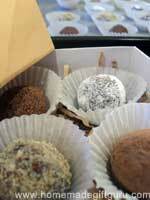 Truffles make wonderful gifts for friends and family. Cook them up, roll them into balls, and coat them in the topping of your choice. And of course, eat with friends! They make great homemade gifts all year long... especially for Valentine's Day, Hostess Gifts, thank you gifts, wedding favors, Christmas baskets... and really just about any holiday or occasion that you would like to give a small but very sweet gift! Intimidated? Don't be. They're easy. Just start with excellent quality chocolate and follow the truffle recipes below. Things to remember... use high quality chocolate and "heavy" whipping cream for best results. Follow the recipe precisely... at least until you've had some practice and you're ready to experiment with your own custom truffle recipes. Make truffles in a dry environment if at all possible and take extra care to keep ganache far from steam and water. Have fun! There is no limit to the many ways you can alter the flavor of this chocolate truffle recipe. For example, you can add flavor extracts or the liqueur of your choice... but start small (it's better to have a subtle flavor than an overpowering flavor that can't be eaten). There's more on adding flavors below. Tip... If this is your first time making chocolate truffles, I recommend reading the trouble-shooting tips below the recipe. Note: Semi-sweet chocolate is usually a touch sweeter than bittersweet chocolate but what's most important, is the quality and taste of the chocolate you use in your truffle recipe. With any chocolate, taste it first to determine if it is actually a chocolate you want to use in your truffle recipes. If it tastes bad or low quality, you may want to find another brand of chocolate. You'll also need... Serrated Knife for chopping chocolate (or use chocolate chips). Medium saucepan. Heat Safe Glass Bowl. Rubber spatula. Measuring Cups and Spoon. Parchment or wax paper. Shallow dish for rolling truffles in chosen topping. Optional... you may like to use a sieve to effectively shake off extra powder if you'll be coating truffles in a fine powder such as powdered sugar or cacao powder. 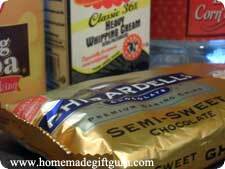 Chop chocolate with a serrated knife or use chocolate chips. Place chocolate into a heatproof bowl and set aside. Pour cream and light corn syrup into a medium saucepan. Bring cream and syrup to a rolling boil over medium heat, stirring constantly. Pour boiling cream directly over chopped chocolate. Allow to sit for 5 minutes. Stir gently but persistently with rubber spatula until lumps are gone and all chocolate is smooth and even. Tip: The stirring process starts with a lumpy looking mess but with gentle yet persistent stirring, it will turn incredibly smooth and glossy. Tip: If chocolate chunks remain after a couple minutes of stirring, you can place your microwave safe bowl (one reason to use a microwave-safe glass bowl rather than stainless steel) in the microwave for a few seconds, remove and stir again. Repeat as needed. This is usually not necessary but handy to know. Pour ganache into a shallow dish and allow to sit out for about 10 minutes (it cools more evenly this way). Place in refrigerator until firm, could be a few hours or overnight. 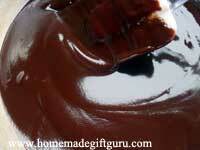 Once firm, scoop a bit of ganache with a teaspoon and roll into a ball. 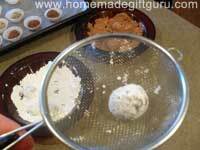 Place the ball in coco powder (or other topping) and roll until well coated. Tip: Keep your hands clean and as cold as possible. Repeat this until all the ganache is rolled in balls and well coated in the topping of your choice. Tip: When using a powdered coating such as cocoa powder, it can be helpful to put each truffle in a sieve and roll it around to remove excess powder (as shown). Store in the refrigerator in an air tight container. Many people prefer to allow their homemade truffles to come to room temperature before eating (we like them either way). Makes about 1 1/2 cups ganache or around 24 (1/2 ounce) truffles. Chocolate Burns Easily: If your ganache smells or tastes burnt, it probably is. Chocolate burns easily if heated too quickly or heated to too high of a temperature... dark chocolate can burn at temperatures above 120°F/50°C while milk and white chocolate can scorch or burn above 110°F/45°C. Keep Water Away From Chocolate: If your ganache suddenly gets lumps, it may mean that it has seized. This can happen if water or steam gets into the mix. This can also be a result of scorching or burning the chocolate during the heating process. Be aware of temperatures: Do not mix cold flavorings into warm ganache. This will cause your ganache to clump or seize. Flavorings such as extracts, oils, liqueurs, fruit purees and butters should be room temperature when added to slightly warm ganache. Add to cold cream: Infuse cream with flavor by soaking crushed herbs and tea leaves, spices, citrus rinds or coffee beans in cold cream overnight. Strain well before using in recipe. 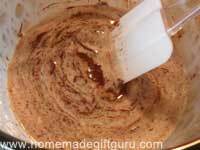 Add to hot cream: Instant coffee, herbs and spices can be added to the cream as it is heated. Herbs and whole spices should be strained out before pouring over chocolate. Pairings Make Great Gifts: Some flavors compliment each other, either because they are so similar or so completely opposite. Dark chocolate and red wine can be very complimentary. Champagne and truffles also make a very classy gift. The trick to choosing great pairings is to find flavors that compliment each other due to either their similarity or because they are opposites... for example, a bitter taste and a bold but fruity taste often bring out the best in each other. It's fun to experiment and picking out fantastic pairings is a great excuse to sample your own work! For an easy chocolate coating short-cut... A neat and very easy way to add real chocolate coating is to coat truffles in shaved chocolate, as seen to the right. You can even use shaved white chocolate to add contrasting color to your dark chocolate truffles. Keep in mind that, the topping you choose, will add texture to your truffles. You can also experiment with shaving chocolate bars with fun flavors (such as mint chocolate, cherry chocolate or dark chocolate espresso) for even more flavor possibilities. Truffles also taste great and look gorgeous when dipped in melted chocolate! The easiest way to do this is to simply melt some chocolate, using a fork (or two forks) dip each truffle in melted chocolate and then place it on a cooling rack or a baking sheet. Set chocolate by cooling completely in the fridge or freezer. If you want a super glossy, stable chocolate finish that is perfectly set (it snaps like a candy bar), you may want to learn how to temper your chocolate. Tempering chocolate is actually quite easy... it's a process of gently melting your chocolate (without making it too hot) and then bringing it back down to room temperature. If you're interested in learning how to temper chocolate, here's a video that makes it pretty easy to understand. 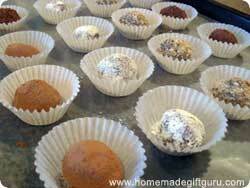 Once you make a batch of truffles for gift giving, you must do your best not to eat them all! ...The best way to do this, is to get busy packaging them, creating the gorgeous presentation they deserve. How will you give away your truffles? Many years ago, for Valentine's Day gifts, my mother made an origami box for all the teachers and staff at the school where she worked... she put a single truffle inside each one. They were so cute and classy. 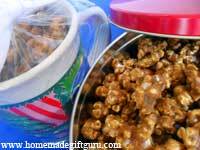 This works especially well for extremely rich and satisfying treats like homemade truffles! You could also make your box even more elegant, by making a clear lid, like the ones here. Wrap your gift box with ribbon and add one of these free printable gift tags, or make your own gift tags using one of these gift tag templates. 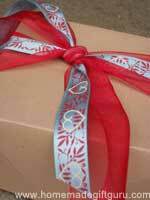 Embellish your boxes, for example using ribbon, raffia, buttons, charms or scrapbook embellishments. 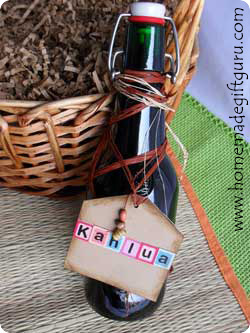 You may also like to add one of these "made with love" tags or a "made by ______" tag... get these tags just for homemade gifts here. 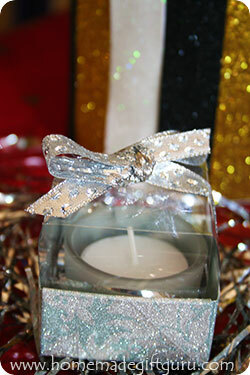 Make your gift packaging match the holiday or occasion at hand and enjoy! If you've never made an origami gift box, feel free to check out my origami box instructions. They are actually quite easy once you get the hang of making them! What size origami boxes work best? A 2" x 2" box is the perfect size for a single truffle (see right). The truffle should be placed inside a mini cupcake liner if possible to keep everything clean and to prevent oil from the truffle from staining the gift box. Either lay shred underneath four truffles as seen to the left, or use a piece of 4" x 4" card stock or paperboard to add a second layer of truffles, creating a box of eight homemade truffles. Tip... Make your 4" x 4" box sturdier by inserting a 4" x 4" piece of card stock or paperboard inside the bottom of the box. If you don't have paperboard, simply cut some from a cereal box facing the plain gray side up. 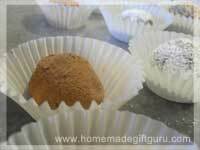 I hope you enjoy my chocolate truffle recipe and any flavor variations you feel inspired to try! Truffles are a lot of fun for sure. In addition to chocolate truffles, there are many other types of truffle recipes such as these easy OREO Truffles and this fun Rum Ball Recipe for adults!